stylos: Malcolm Watts: Burial or Cremation? Although cremation, or the disposal of the dead by burning, was practiced in ancient times, it was not re-introduced into England until the end of the last century. Sir Henry Thompson, an agnostic who became professor of Surgery at the Royal College of Surgeons, publicly urged the case for cremation and due to his influence it became widely accepted in this country. In 1874 he played a major part in the forming of The Cremation Society, which was specially founded ‘to advocate this rational and hygienic method of disposal of the dead’. is new method met strong opposition at first but it gradually gained favour. According to the Encyclopaedia Britannica, ‘Freemasons, materialists, and Marxists… joined the movement.’ Klaas Runia, in the Encyclopaedia of Christianity, draws attention to the fact that in these early days, support chiefly came from ‘humanitarians and liberal theologians’. When in 1884 Justice Stephen declared cremation to be a legal procedure, the necessary impetus was given to the movement. It quickly became an established practice. By 1960 about one third of all who died in England, Scotland and Wales were cremated and the proportion was then increasing by two per cent per annum. Today cremation is often the preferred alternative, as evidenced by the Obituary columns in national newspapers. Ministers have tended to assume a position of neutrality on this matter. One well-known evangelical was asked fairly recently which method he thought ought to be chosen by the Christian. His reply, given in the column of a denominational newspaper, was fairly typical. ‘Neither,’ he wrote, ‘has any marked advantage over the other, providing the ceremony is carried out with the dignity that is to be accorded to the human body.’ Neither Scripture nor conscience will allow us to agree with him. 2. It leaves the land for the living. The system of burial is wasteful, it was claimed, ‘preventing the economic use of valuable land for housing and recreation.’ A sentence from the quaint biblical commentator, John Trapp, deserves consideration here. ‘It is remarkable,’ he says, ‘that the first purchase of possession mentioned in Scripture, was a place to bury in, not to build on.’ (See Gen 23). The patriarch, taught by nature as well as grace, had learned the importance of caring for the bodies of the dead and of making provision for decent interment. Only heartless materialism would dare to challenge that loving concern. 3. It preserves the countryside. Attention was drawn to ‘the sprawling wastes of neglected graveyards and cemeteries’ which could only be described as ‘an eyesore.’ at such places do exist, no-one will deny, but it does not have to be so. In Bible times, sepulchres were generally situated in attractive places; under the shade of trees (Gen 23:8-9,17; 35:8), in groves or in gardens (2 Kgs 21:18,26; Jn 19:41) and, in the case of public burial-grounds particularly, every effort was made to preserve natural beauty. It was the observation of Dr. George Douglas that ‘burial-places in the East are still kept with great neatness.’ As to the tombs themselves, when looked after, they can appear quite ‘beautiful’ (Matt 23:27). Our Lord, though rebuking the ‘hypocrisy’ of the scribes and Pharisees who professed to honour the prophets while manifesting the spirit of their murderers, mentions the fact that at least they showed care for their tombs. ‘Ye build the tombs of the prophets’, He said, ‘and garnish (or adorn) the sepulchres of the righteous’ (Matt 23:29). In a day when money and time are freely spent, it is to the nation’s shame that so little is done to improve the state of our cemeteries. This claim is made because ‘the law respecting cremation demands two certificates signed by independent medical practitioners, and the approval of a medical referee.’ is means, they say, that ‘the cause of death’ is ‘definitely established.’ However, it must surely be apparent to all that a situation could arise when, after the funeral, a further examination of the body could prove to be of immense value. With cremation, of course, it would not be possible, whereas with burial, exhumation could take place (cf. Jer 8:1). This being so, burial would tend to discourage crime far more than cremation. 5. It makes for a more rational outlook. Here the emphasis is laid upon ‘the heartbreak of the yawning grave’ and ‘the clammy clay.’ It is true that whatever provision be made for the disposal of the body, death’s bitterness cannot be altogether removed. Yet, that agreed, given the choice between placing the bodies of those we love in an incinerator heated to 2,000°F and laying those bodies gently in the ground that they might, as it were, ‘sleep in the dust’ until the grand awakening of the resurrection morning (Dan 12:2), we, for our part, unhesitatingly choose this latter course as every way more conducive to our comfort and consolation. 6. It is an economic method. The point made is that not only is ‘the process itself inexpensive’ but also that there is ‘no grave to buy and no tombstone to provide and preserve.’ Is economy, however, the all-important factor? Evidently Abraham did not think so when, out of love and respect for ‘his dead,’ he paid the high price of ‘four hundred shekels of silver’ for a plot of ground (Gen 23:13-16). We even read that the chief priests devoted the betrayal money to this purpose so that they might appear devout, so generally was it considered to be an act of mercy and kindness (Matt 27:7; cf. 2 Sam 2:5). Neither ought tombstones to be reckoned items of unnecessary expense. What lessons they are able to teach the living about mortality and eternity! Yet their main service, surely, is to those who have died. To use the words of James Hervey, it is as if those stones have received ‘a charge to preserve their names’ and are ‘the remaining trustees of their memory.’ (Gen 35:20; 2 Kgs 23:17; cf. Ezek 39:15). So long as these engraven records are before the public, the dead will be kept in remembrance and, according to God’s Word, that is a blessing not to be lightly esteemed (see Job 18:17; Ps 112:6; Prov 10:7). Not one of these arguments for cremation is in any way convincing, based as they all are upon human reasoning. A question of fundamental importance must now be asked: ‘What saith the scripture?’ (Rom 4:3). (1) Immediately after the Fall of Adam, God made it clear that, because of his sin, man was to be interred in that earth from which he originally came: ‘In the sweat of thy face shalt thou eat bread, till thou return unto the ground; for out of it wast thou taken’ (Gen 3:19). As Francis Roberts once correctly observed, ‘Here man is not only sentenced to death, but also to the grave.’ God’s Word still stands. Adam and all descended from him must ‘return’ to this appointed place (Ps 90:3; 104:29; Eccl. 12:7). A grave belongs to every man. Hence that scripture which says, ‘His breath goeth forth, he returneth to his earth.’ (Ps. 146:4). (2) Not a great deal is known about very early funeral rites and customs, but enough evidence is available to show that cremation was certainly the ancient and widespread practice of the heathen world. We know, for example, that among the Babylonians ‘cremation, mostly incomplete, was the practice.’ (A Dictionary of the Bible edited by Sir William Smith). Among the Greeks it was also usual to dispose of the body in this way. ‘Greeks burned the bodies of their dead, and deposited the ashes in graceful urns or under Stelae (tall tablets).’ (Black’s Bible Dictionary). The Romans too seem to have preferred this method and ‘during the first four centuries of the empire, the body was, in the great majority of cases, consumed by fire, and the ashes consigned to the tomb in an urn.’ (A Manual of Roman Antiquities, by William Ramsay). In modern heathendom little has changed. Buddhists still bring their dead to the pyre; Hindus do the same. is connection with heathenism becomes a strong argument for rejecting it. God has said: ‘Learn not the way of the heathen’ (Jer 10:2; cf. Lev 18:3,30; Deut 18:9). (3) From the beginning God’s people rejected the heathen way of treating the dead. As Dr. Alfred Edersheim observed: ‘Cremation was denounced as contrary to the whole spirit of Old Testament teaching.’ The Jews believed very strongly that burial was divinely appointed and this became the universal custom among them (Gen 25:9; 35:29; 50:13; Josh 24:30; 2 Kgs 13:20; 2 Chron 9:31), the only exceptions being when there was fear of mutilation by an enemy (1 Sam 31:12) or when it was physically impossible in a time of plague (Amos 6:9-10). That the Jews always chose ‘to bury rather than to burn their dead bodies’ is a fact noted by Tacitus, the Roman historian; but we really do not need the testimony of secular history: Scripture itself tells us that ‘the manner of the Jews’ was ‘to bury’ (Jn 19:40). Although the burning of the dead prevailed throughout the Roman Empire when Christianity first appeared, the early Christians strongly objected to it. 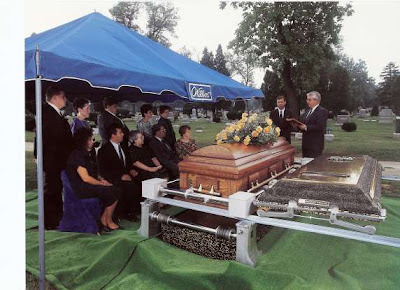 Accepting, as they did, the main Jewish arguments against cremation, they believed that in the burial of the Lord Jesus, an example had been given to the Church (1 Cor 15:3; cf. Rom 6:5 – ‘we shall be... in the likeness of his resurrection.’ It would seem fitting to be like Him in His burial too) and so their dead were deposited very carefully in sepulchres. After the death of the first martyr, for example, we read how ‘devout men carried Stephen to his burial, and made great lamentation over him.’ (Acts 8:2; cf. 5:6,10). Municius Felix, an early defender of the Christian faith, no doubt spoke on behalf of the whole Church when he said: ‘We observe the old and better custom of interment.’ The Church’s opposition to cremation eventually brought about change. It is an indisputable fact of history that ‘when Christianity began to increase, the funeral flames did cease, and after a few emperors had received baptism, there was not a body burnt in all the Roman Empire.’ (Dr. John Pearson). (4) The Bible teaches that when the soul returns to God at death, the body enters the grave as into a new ‘house’ (Job 30:23; Is 14:18). This is represented as a vast house, with many private rooms or apartments called ‘chambers of death.’ (Prov 7:27) and in these the dead ‘rest in their beds’ (Is 57:2; 1 Chron. 16:13-14). This language, so descriptive of burial, would be quite inappropriate – in fact, devoid of all meaning – once cremation is considered. is also applies to the apostle’s illustration in 1 Corinthians 15, where he likens the body to a seed: ‘that which thou sowest’ (1 Cor 15:36-44). Since all these allusions point to burial as the proper mode, we certainly do not feel at liberty, to institute the very radical change required by cremation. (7) Fire has always been connected with judgment. Sacrificial victims, charged with sin, were burnt (Lev 4:12; 6:30). Idols and images, so hated and abhorred by God, were thrown contemptuously to the flames (Exod 32:20; Deut 7:5). The bodies of people guilty of heinous crimes were consigned to devouring fire (Gen 19:24; Lev 10:2; 20:14; 21:9; Num 11:1; 16:35; Josh 7:15). Related as it is to punishment, it is not at all surprising to find that fire is the element of torment in hell (Matt 13:50; 25:41; Lk 16:24). It must surely be wrong to use fire in disposing of the body. For the Christian, whose sins are all pardoned, it is so dreadfully inappropriate. God has shown that burial is fitting and right. When there was nobody around to arrange for the disposal of Moses’ body, God saw to it Himself and ‘he buried him in a valley in the land of Moab’ (Deut 34:6). We should take very careful note of the fact that it was Satan who objected to this, desiring to deprive God’s servant of a decent and honourable burial (Jude 9). We close with a further quotation from John Pearson’s Exposition of the Creed (1659): ‘ The first Christians wholly abstained from consuming of the dead bodies with fire, and followed the example of our Saviour’s funeral... The description of the persons which interred Christ, and the enumeration of their virtues, and the everlasting commendation of her who brake the box of precious ointment for His burial, have been thought sufficient grounds and encouragements for the careful and decent sepulture of Christians. For as natural reason will teach us to give some kind of respect unto the bodies of men, though dead, in reference to the souls which formerly inhabited them: so, and much more, the followers of our Saviour, while they looked upon our bodies as living temples of the Holy Ghost, and bought by Christ, to be made one day like unto His glorious body, they thought them no ways to be neglected after death, but carefully to be laid up in the wardrobe of the grave, with such due respect as might become the honour of the dead and comfort of the living. And this decent custom of primitive Christians was so acceptable unto God, that by His providence it proved most effectual in the conversion of the heathens and propagation of the gospel.